Can you believe that November is upon us? Tomorrow evening little kids (and more than a few young adults) will be dressing up as ghosts, goblins, princesses, and, inevitably, Miley Cirus. We’ll wake up on Friday to a sense of urgency to move on to the next holiday….boxes of mini candy bars will be on clearance and “Jingle Bells” will have us all thinking about chestnuts roasting and candy canes. But let’s hold on to autumn for a little longer, shall we? I don’t want to rush it. Let’s talk squash. It had never occurred to me to puree squash and use it as a pasta sauce until I read this recipe. It made me very excited. 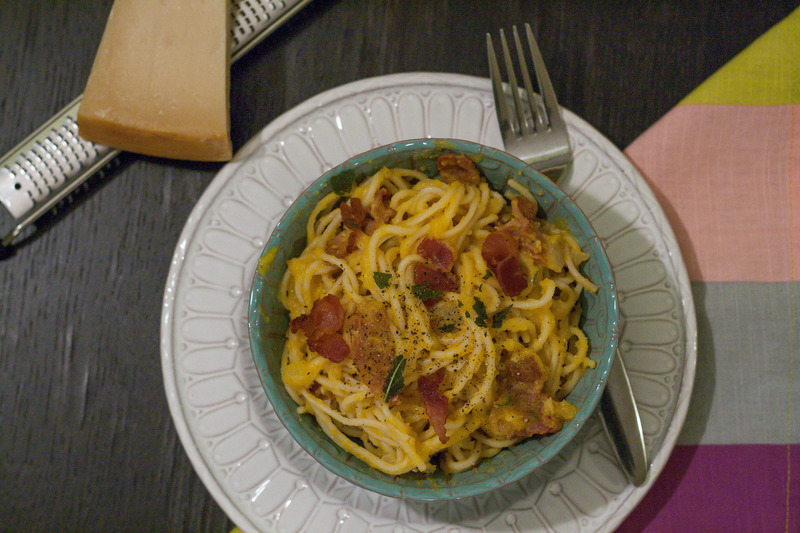 I also feel there are certain foods that just love to be together…this includes bacon and butternut squash. 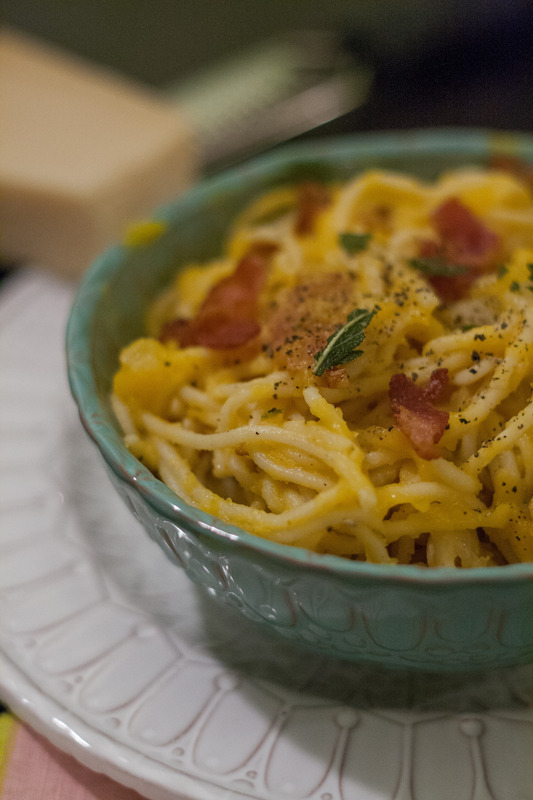 The sweetness of the squash and the saltiness of the bacon is an irresistible combination. 1/ Boiling the squash makes this a fast and conceivable weeknight meal. If you prefer not to peel and dice the squash (hard to argue that it is a bit of a task), I think you could simply halve the squash, scoop out the seeds, and roast it at 400F for 25-35 minutes. I think I might try this method next time to see how the roasting might enhance the flavours. 2/ The author of the recipe says we must not skip the step of frying the sage. Realistically, for an everyday meal, I’m probably going to skip it next time and get the sage flavour from chopping it and stirring it in. While the squash is cooking, heat the 3 tablespoons of oil in a large skillet until the surface is ‘shimmering’. Sometimes I tilt the pan so the oil forms a deeper pool. Cook the sage leaves (just a couple at a time) for about 30 seconds or less. They will appear crisp, but still bright green. Season with salt. Pour out the oil; you’ll be using this pan again. When the squash is cooked, remove the squash from the boiling water with a slotted spoon. You’ll be using this boiling squash water to cook the pasta. Add the pasta and cook until al dente. Meanwhile, add the squash to a food processor and process until smooth. Add liquid until desired consistency. Heat that frying pan you used for the sage. Fry the bacon until desired crispiness. Remove from pan. Reserve 1-2 tablespoons of the bacon fat. Cook the onion until softened, about 5 minutes. Add the garlic and cook until fragrant, about 30 seconds. Pour squash into frying pan and mix with onions and garlic. Add parmesan cheese, half the bacon, nutmeg and salt and pepper to taste. There is nothing quite like biting into an apple straight off of the tree. 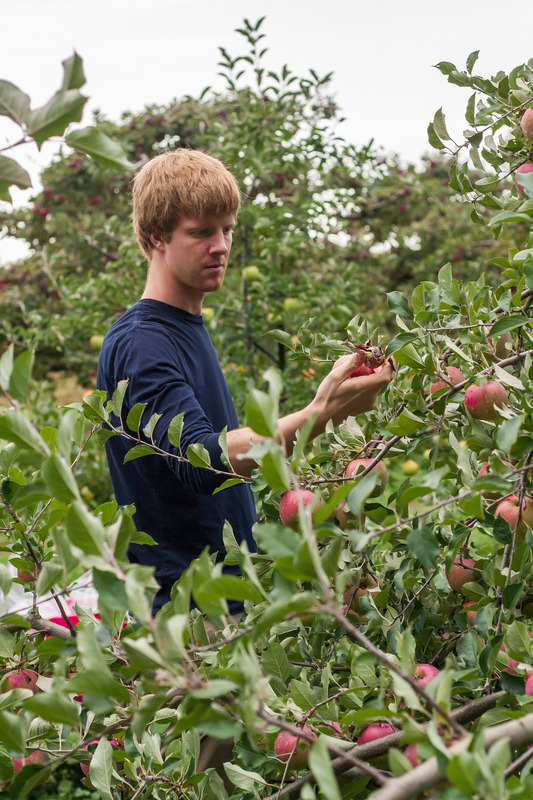 For Canadian Thanksgiving, I went with my husband and his parents to Birch Farms for some apple picking. 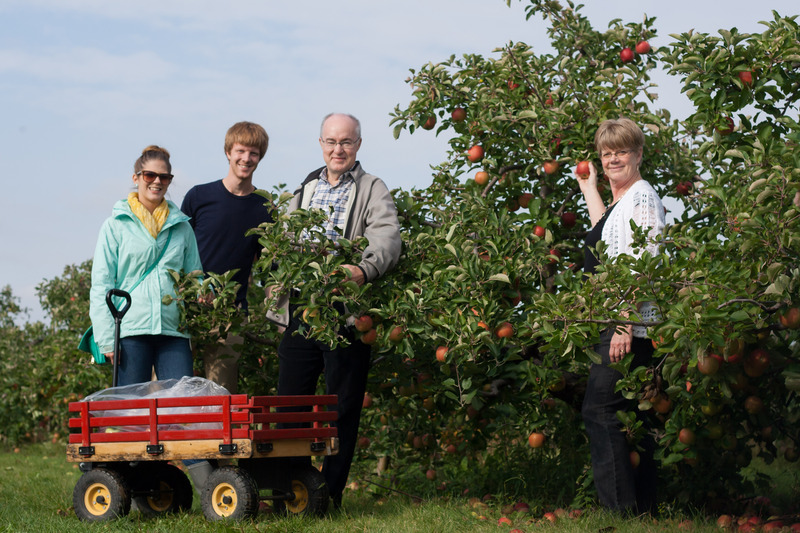 We came back with quite the haul, which is great for this ‘apple-a-day’ girl. 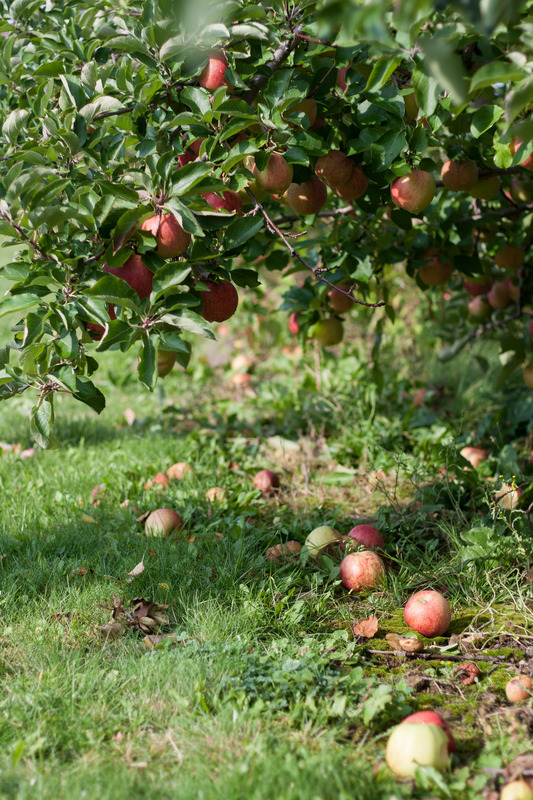 The apples last for ages in the fridge (considering they’re coming right from the tree) – just be aware to separate your apples from your other produce…it can cause it to spoil faster! Many people think of sweet cooking when it comes to apples – pies, crumbles, cakes, apple sauce…the list goes on. Apples truly do have many savoury applications, and this easy recipe is one we’ve made countless times – a family favourite for sure! 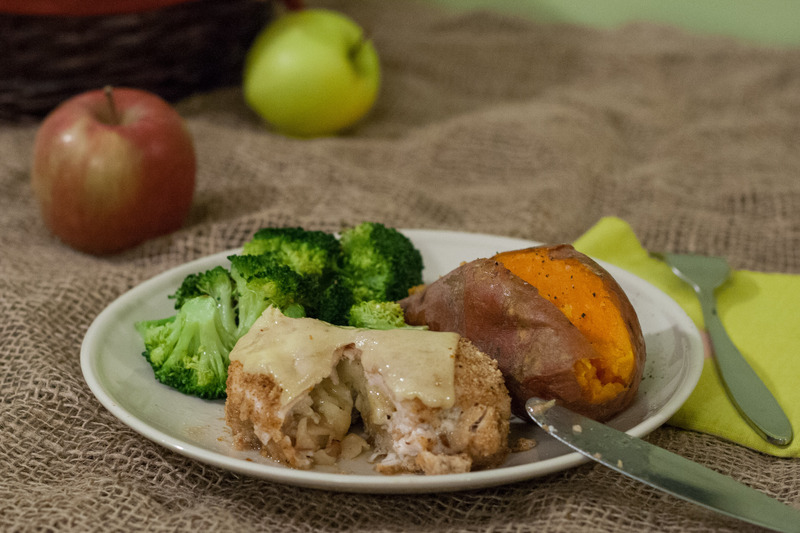 The salty cheese and the tangy cider vinegar make the filling in this chicken so delicious. Prepare chicken and season with salt and pepper. Spread breadcrumbs on a plate and season with salt and pepper. 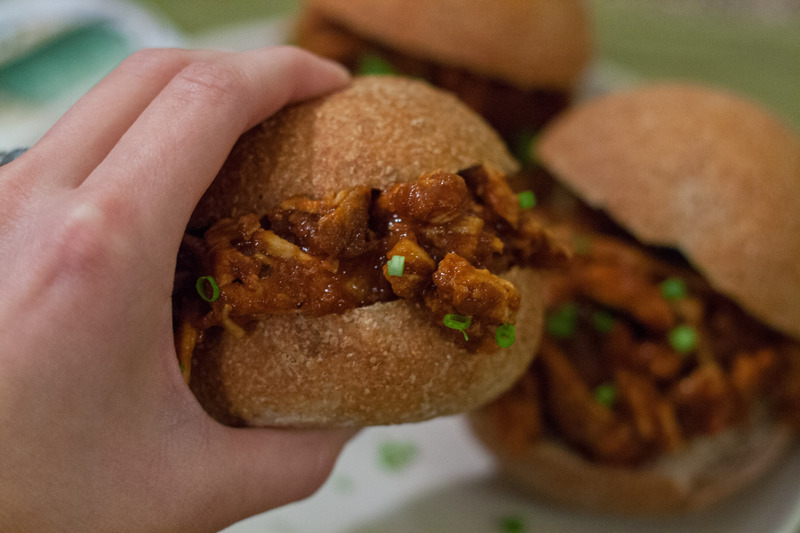 Lay chicken breasts on top of breadcrumbs. Set aside. In a frying pan, heat oil over medium. Add garlic and cook until fragrant. Add apples, vinegar and syrup. Cook over medium for about 8-10 minutes until most of until liquid has evaporated. 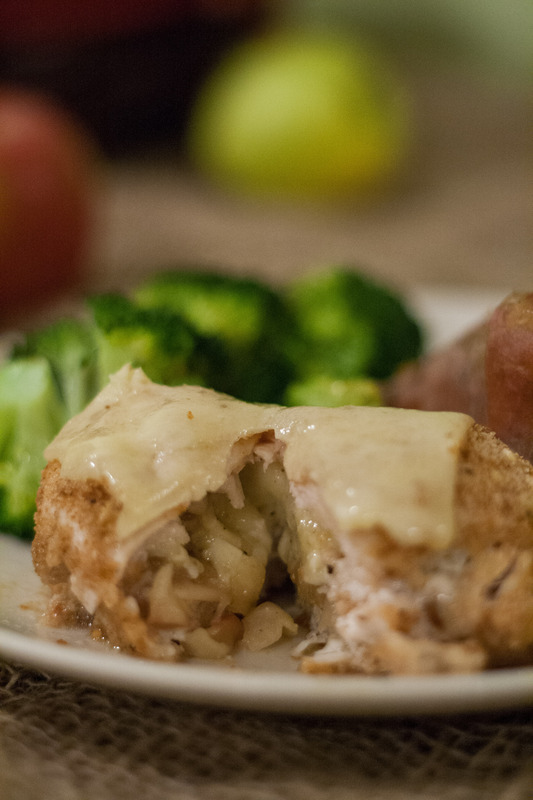 Lay cheese on top of chicken and divide apple mixture among the breasts. Roll the breasts and secure with toothpicks (make sure you count how many you put in! ), ensuring an even coating of breadcrumbs. Bake for about 20 minutes (depending on size of your chicken breast). If you like (or have extra cheese), put some on top of the chicken for the last 7 minutes, or so, of baking. I haven’t had a great deal of success with slow cookers, or “Crock-Pots”. Usually I produce something that is just…’meh’. This recipe is the exception. I love this meal. This may be Andrew’s favourite thing that to come out of our kitchen. 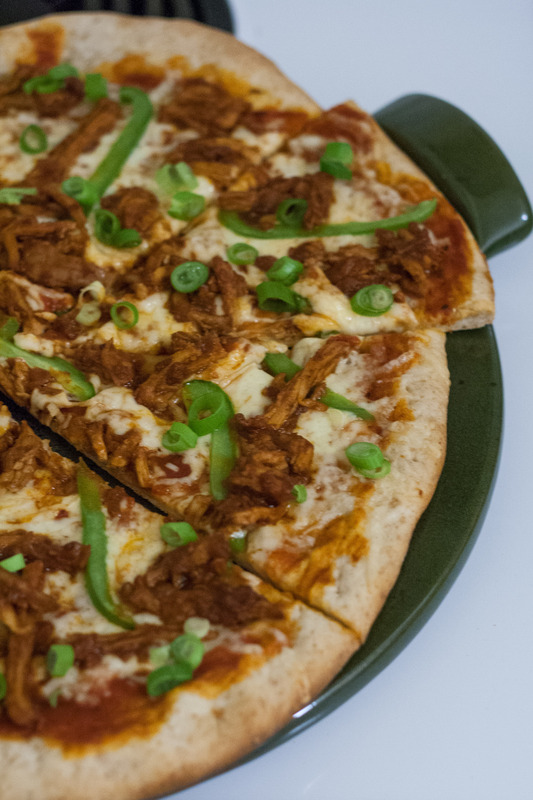 We have used the meat for sandwiches, pizza toppings, and tacos. All amazing. I also have this image of pulled pork nachos floating around in the back of my mind…hockey night, anyone?? 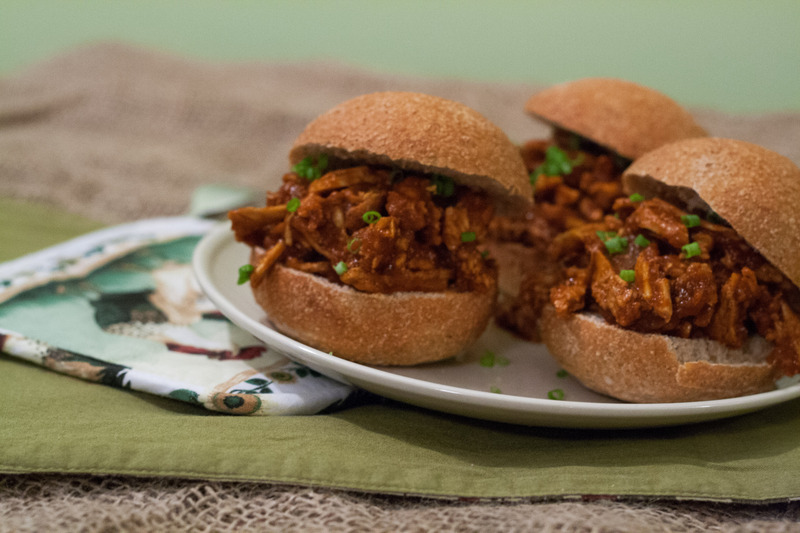 Top the sandwiches with simply green onions, or your favourite slaw recipe. We have tried this with cheap pork loin (as seen in these photos) when it goes on sale. It’s definitely not as moist as using shoulder, but still enjoyable. Season the pork with salt and pepper. Heat the oil in a large/deep pan (or dutch oven). Brown the pork on all sides and transfer to slow cooker. Sauté the onions, until softened (about 5 minutes. Add garlic, chilli powder, coriander and bay leaves. Cook until fragrant. Add the tomato paste and cook for about 2 minutes. The tomato paste will darken. Add the tomato sauce, sugar, vinegar, Worcestershire sauce, scraping up those tasty brown bits. Pour into slow cooker over the pork. Cook the pork on low until tender, about 8-10 hours. Shred the pork and add to the sauce. Serve up as desired, with green onions. I like to think we all have goals. Big goals; little goals. Daily goals; life goals. I have this ’cooking bucket list’. It is, unfortunately, growing faster than I can keep up. I consider the things on this list a little bit more complex than the average food item; thus things like work and making real dinner interfere with spending a whole evening making one thing. Recently, I found a day. I found a weekend day where I could pick something from that bucket list and tackle it. This recipe surprised me. It was by no means tricky. It is not even labour intensive. In fact, I was tickled by how little active work was involved…and by how impressive the results were. These are infinitely better than the pocket pita bread we buy at the store. These are like pillows. However, If I am honest with myself I know I will continue to buy the ones at the store…most of the time. That difference between ‘all the time’ and ‘most of the time’ is good enough for me to feel like I have achieved a goal! In a large bowl, combine yeast, sugar and ½ cup water. Stir gently. The temperature of the water is important because it is the optimal temperature for the yeast to ‘do its business’. Add ¼ cup of bread flour and ¼ whole wheat flour and whisk until smooth. Cover the bowl with plastic wrap and set aside until doubled. It will appear very bubbly and awesome after about 45 minutes. Remove the plastic wrap and add the remaining ¾ cup warm water, 1 ¼ cup bread and 1 ¼ cup whole wheat flour, olive oil, and salt. I used my hands to mix and kneaded for about 8 minutes. If you are lucky enough to have a stand mixer, use the dough hook for about the same amount of time. The dough will be smooth and elastic. Add more flour as necessary…I probably put another ½ cup or so in. After the dough has risen, preheat the oven to 500F, and place a baking stone in the oven at the lowest rack. You can use the bottom of a baking sheet if you don’t have a stone, or apparently right on the oven racks. Time to shape them. I used a kitchen scale to ensure they were all about the same size. I ended up with 8 100g dough balls. Stretch them out (by hand or with a rolling pin) to about a 7 inch diameter. 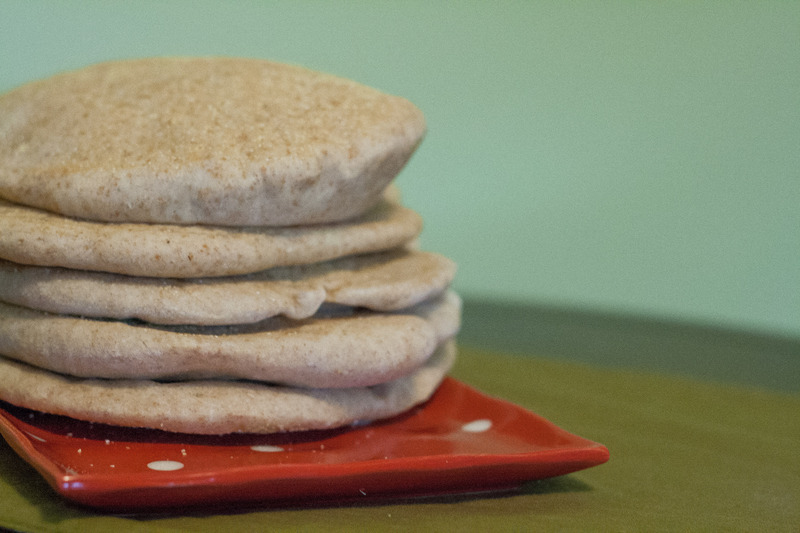 Place your pita rounds on a surface lightly sprinkled with cornmeal. Cover them loosely with clean towels and let them rise for about 30 minutes. They will appear slightly puffed. Time to cook. Transfer 3-4 rounds to your baking stone (depending on how large it is). Bake for 2 minutes. 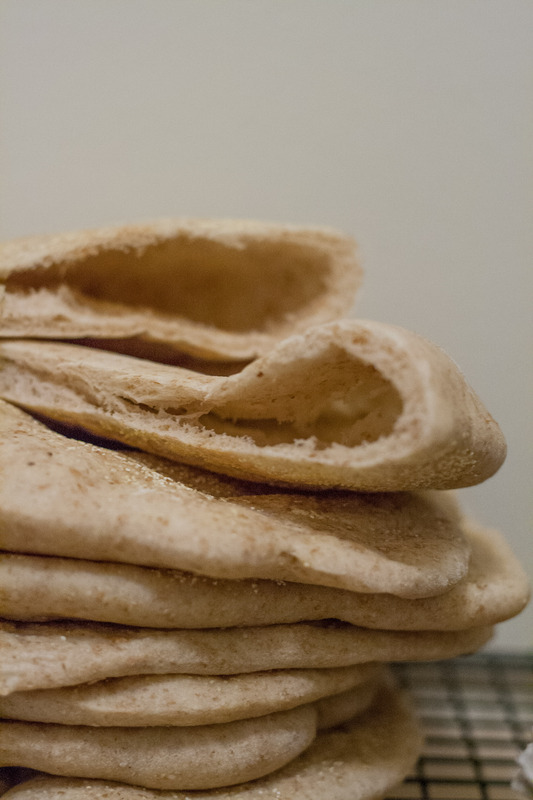 The pitas will puff up and turn slightly golden. Flip and bake for 1 minute more. Transfer to a cooling rack. Repeat. 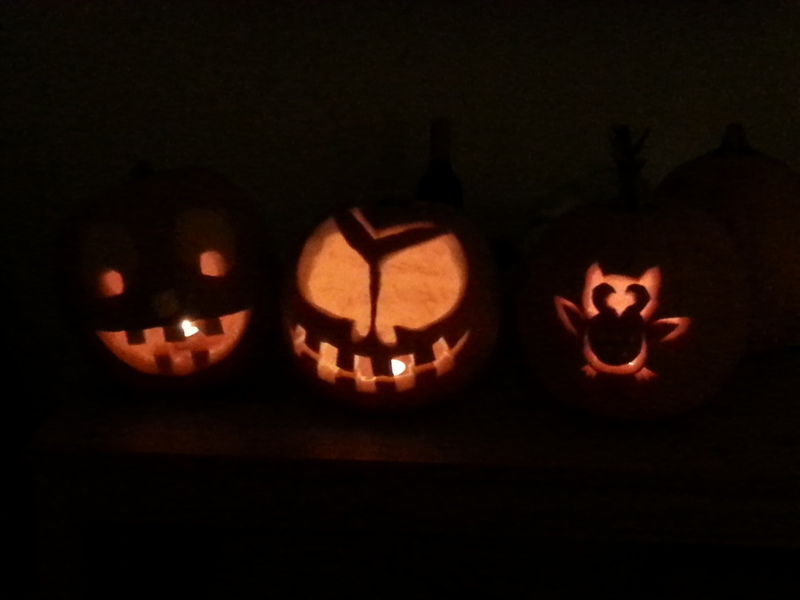 A few of ours didn’t puff up. I couldn’t tell you why, but I think it’s because I didn’t let our oven get back to a high enough temperature after opening and closing the door. I find that when October hits, we are absolutely bombarded with pumpkin EVERYTHING. To be honest, I have never been that interested. I never opt for the pumpkin pie at Thanksgiving; I don’t really care for the infamous Pumpkin Spice Latte from Starbucks…what’s all the fuss? 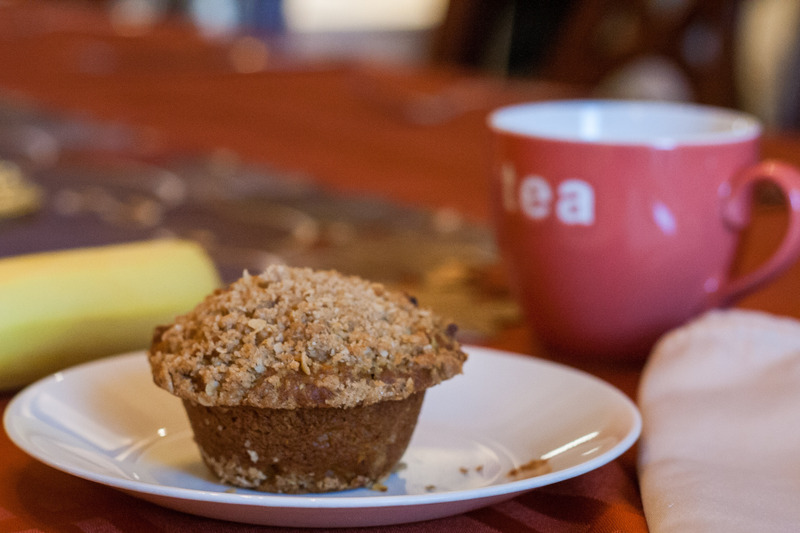 Not 24 hours passed before I baked a dozen for myself; jazzed up with a crumble topping. I’ve had the pumpkin “Kool-Aid”. These puppies are moist and flavourful; I declared them the best muffin to come out of my oven. Try them and see for yourself. Preheat the oven to 400F. Prepare your muffin tin with liners, or grease the tin directly. Pour the dry ingredients into the wet, and mix until just combined. Combine all ingredients in a small bowl and ‘crumb together’ with hands until it feels somewhat like wet sand. Note: the above picture used ‘quick oats’. I think I would prefer large flake! Recipe for muffins provided by co-worker – original source to come!